Are the kids bellyaching because they're tired of eating hamburgers and hot dogs? Are you overwhelmed by Jackson Hole's famous selection of fine steaks, elk chops and bison medallions? Are you looking for a Western meal to go along with your Western vacation? Well, COOOME AAAND GET IT!!! 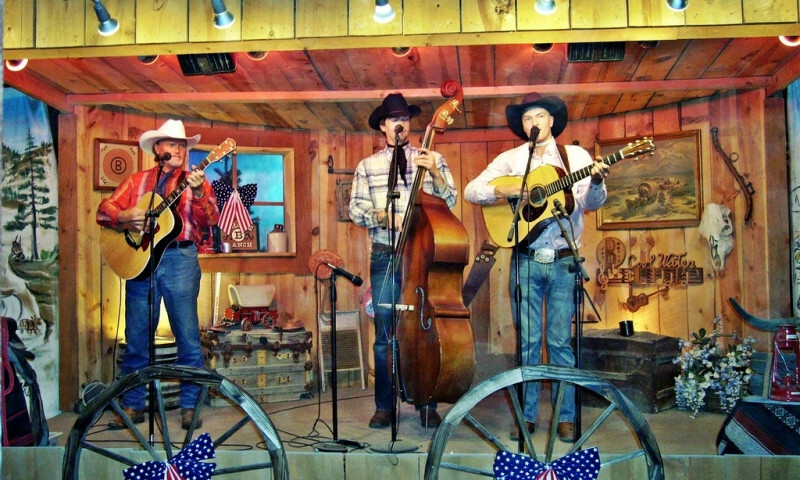 Our horse-drawn covered wagons will take you to our private aspen grove where you will enjoy a ribeye steak dinner and authentic cowboy music. While you await departure for dinner, rugged cowboys greet you with a warm "howdy" as they gallop by on their trusty steeds. Beautiful cowgirls, dressed in authentic Western attire, situate your group and load you upon covered wagons. With a slap of the bridle and a sharp "yah," the horses move to a quick trot. You are underway. Things, of course, are different these days. Instead of hard, wooden seats and clunky, wooden wheels, today's modern wagons are blessed with comfortable, padded seats and rubber tires. Teams of horses are gentle and mild mannered. You enjoy a quiet pace on your way to dinner. It is the perfect atmosphere for meeting people around you, enjoying the scenery and taking some snapshots. Camp is designed to accommodate the summer crowds. 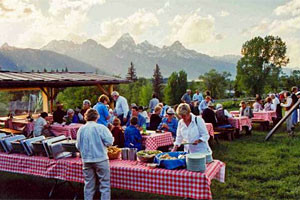 Rows of tables fill the large, open-air tents. Massive grills sizzle with layers of beef and barbecue chicken. Oversized cast-iron skillets clank loudly as hired-hands prepare homemade beans and fresh corn for the evening's feast. Forget about four-star dining. This is eating the cowboy way. Grub is slathered upon your plate. And you can keep coming back until you can't eat any more.